On Thin Ice explores the relationship between the Inuit and the modern state in the vast but lightly populated North American Arctic. It chronicles the aspiration of the Inuit to participate in the formation and implementation of diplomatic and national security policies across the Arctic region and to contribute to the reconceptualization of Arctic Security, including the redefinition of the core values inherent in northern defense policy. Barry Scott Zellen poses tough questions about Canada's own claims to a vast swathe of the soon-to-be hotly contested resource-rich Arctic. Zellen not only shows how much these depend on whether a collaborative and interdependent relationship can be successfully forged with Native peoples struggling to preserve fragile ecosystems and their own ethnic identity, but how conceptions of human security, tribal security and national security are inexorably tied together. Zellen's keen insight and painstaking research suggests that truths from the land of the midnight sun might illuminate and guide the struggles of indigenous peoples around the globe. A must read for the 21st century. For those who know a piece of today's Arctic story, Barry Scott Zellen's On Thin Ice neatly connects the dots from Alaska to Greenland with a wealth of detail. His research and his experience living in the region come together here to buoy a generation of scholars, scientists and policy-makers. Tribal-state relations, border conflicts, militant insurgencies, economic exploitation/dependence, climate change, and oil politics are the stuff of this fascinating trilogy that is not about the Middle East. 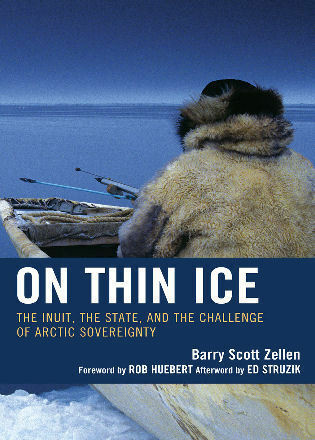 Barry Zellen has written a dense and meticulously researched book on the trials and tribulations of the indigenous peoples of the Arctic region as they strive for sovereignty, and confront and adapt to modernity, globalization, and a potential polar thaw. Zellen tells a story that has significant relevance to many of the present dilemmas facing the international political economic system. I suspect that it is only a matter of time before this book serves as the important primer and source for policy makers concerned with Arctic policy. Barry Zellen is way ahead of the curve in the field of security studies in focusing on the intersection that state rivalries and environmental issues in the Arctic will have on global security and stability. In On Thin Ice, Zellen highlights the important role this part of the world will play in moderating the historic clash between indigenous tribes and the modern state, re-defining the conception and limits of state sovereignty in frontier regions where tribal forces endure. All serious students of security studies should closely examine this work and ensure that it receives the space it deserves on their library shelves and course curriculums. Barry Scott Zellen has written an intriguing and challenging book on the place of the Arctic northern peoples that must be read by anyone interested in the new Arctic. It is not necessary to agree with all of Zellen's arguments to understand that his book is a comprehensive effort to understand the central role that the Inuit must and do play in the developing issues surrounding the transformation of the Arctic. This is a must read for anyone wanting to understand the massive transformation that the Inuit now face in their home. From the Afterword of On Thin Ice:As Barry Zellen poignantly reminds us in this book, the Arctic is no longer a no-man's land of interest only to missionaries, military strategists, and outdoor adventurers. In the not-too-distant future, the forces of climate change are going to transform this icy world into a new economic frontier. The end of the Arctic, as we once knew it, will be the beginning of a new chapter in history. That new chapter in history must be co-authored by the people who live there. Published on the 50th anniversary of Ken Waltz's classic Man, the State and War, Zellen's On Thin Ice is at once a tribute to Waltz's elucidation of the three levels of analysis as well as an enhancement of his famous "Three Images," with the addition of a new "Fourth Image" to describe a tribal level of analysis. This model remains salient in not only the Arctic where modern state sovereignty remains limited, but in many other conflict zones where tribal peoples retain many attributes of their indigenous sovereignty.